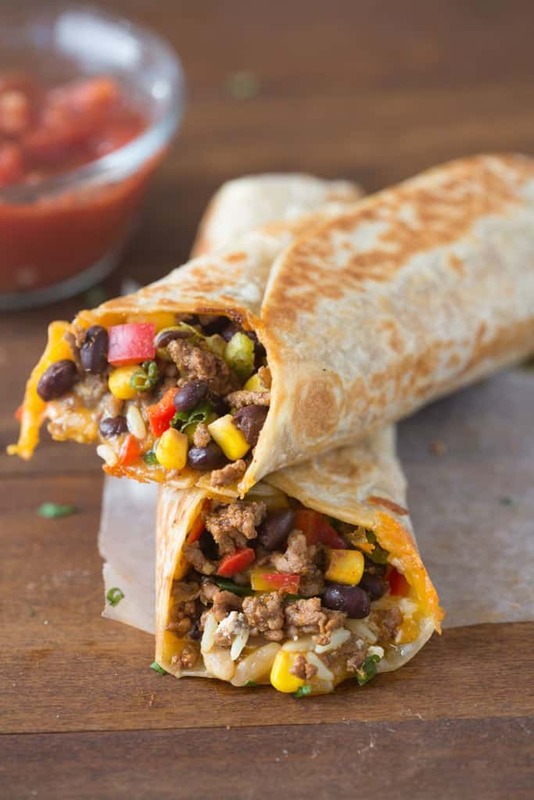 Crispy Southwest Wraps are one of our go-to, easy meals. They take less than 30-minutes and my family loves them! If your house is anything like mine, then the week before Thanksgiving is crazy busy, and the last thing I have time to do is think of a dinner plan early in the week while I’m preparing to host Thanksgiving dinner. Easy meals–we’re talking 30-minutes or less– are my life savers! And meals that my kids will eat happily, without force, are essential! 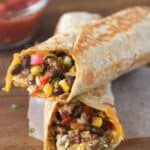 These Crispy Southwest Wraps meet all of those requirements with my family. Everyone loves them, and I love how easy they are. This meal was complete invented out of necessity to use leftovers from my fridge to clear room for things like a big giant turkey that I’ll be roasting in a few days. They’re really easy to adapt, depending on what you have in your fridge, and what your family likes. You could substitute cooked chicken or rotisserie chicken (about 1 1/2 cups, shredded) instead of the ground beef. You could add spinach or any other chopped veggies that you’d like. I love the little bit of sour cream that’s layered in the middle because it adds a creaminess to them. You could substitute it for Greek yogurt and no one would ever know! Also feel free to use any type of tortillas. My favorite part about them is how we make them “crispy” in the griddle before eating them. I also love that these are essentially a “meal-in-one”. You have your veggies, protein, and carbs all wrapped together in one delicious meal! 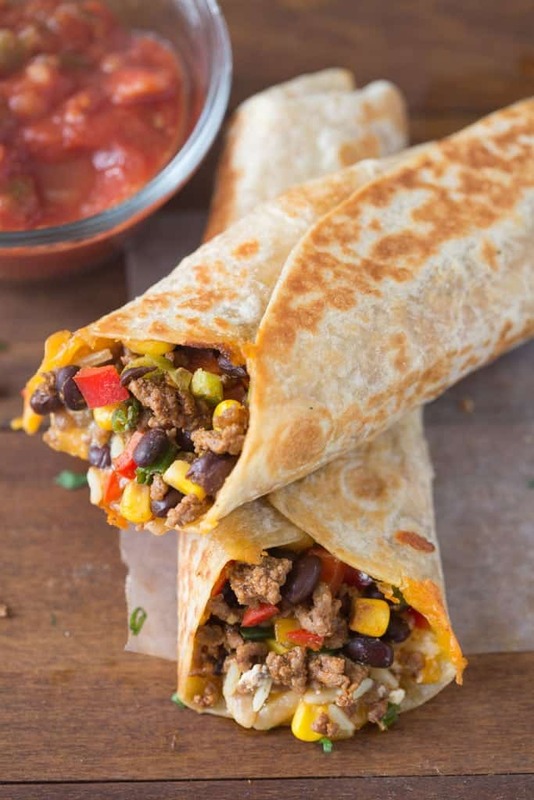 These Crispy Southwest Wraps are a delicious hybrid of a burrito/taco and a wrap. I make sure to serve them with a side of salsa and our favorite Mexican hot sauce, valentina. Add the ground beef to a large skillet over medium heat. Cook and crumble until browned. Drain grease. Season with a little salt and pepper and add chili powder, cumin, garlic powder and water. Stir to combine. 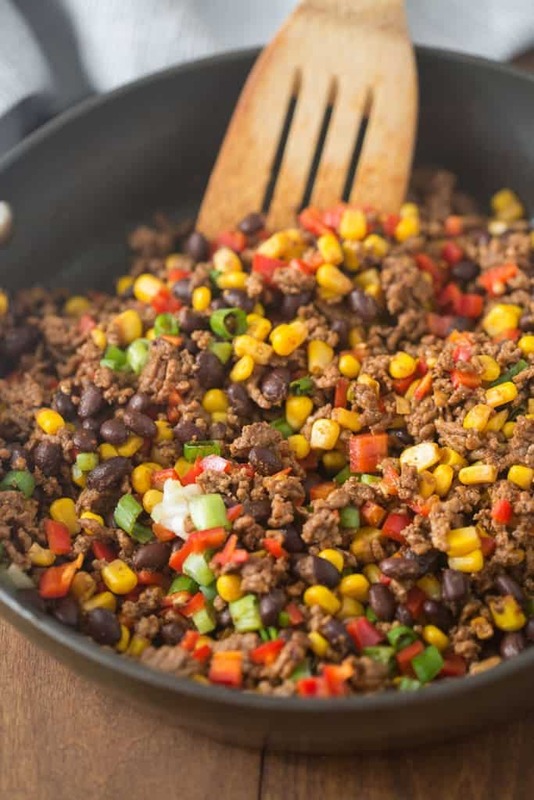 Add black beans, corn, bell pepper, and onions and toss to combine. Saute for a 2-3 minutes. Warm the rice. Layer tortilla with a handful of cheese evenly spread across the tortilla. Add a small scoop of rice, placing it in a line along one end of the tortilla. On top of the rice add a few small dollops of sour cream, and a spoonful of the beef filling. Starting at that end, roll the tortilla up, folding in the sides like a burrito. Spray the skillet generously with cooking spray and place the wraps seam side down on the greased skillet. Gently brush the tops of the wraps lightly with oil, or spray them with cooking spray. Turn the wraps every minute or two until they are golden and crispy on all sides. Serve warm, with salsa and/or a creamy cilantro dipping sauce. Had leftover chuck roast and substituted it for the ground beef. I tweak my spices for our tastes (we like it hot). Delicious ? This was a fantastic recipe. I added chipotle pepper, an avocado and juice from half a lime along with a half cup of chopped tomatoes. Used quinoa instead of rice. Very versatile to what you have on hand. I loved the crispy wrap but think it will be equally as tasty alone, with chips or maybe on a lettuce wrap. Yum and thank you! Turned out great! We added freshly chopped tomatoes and sour cream on top. Awesome meal! Super easy and yummy! thanks for the recipe. Was terrific thank you for sharing! I know it’s a good recipe when my husband asks me to make it again. He has asked for this one three times so far! Perfect with a cilantro avocado dressing. Looks great. I am going to try this recipe tomorrow, do you think they would be ok to make extras and freeze them? I haven’t tested freezing these, but I think it could work!